He was the son of Robert Archibald Armour and Elizabeth Emily Crossley. [S2] Index of BDM records, NSW BDM, Place of Registration: Yass; Year: 1914; Number: 33219. [S2] Index of BDM records, NSW BDM, Place of Registration: Boorowa; Year: 1938; Number: 11585. She was the daughter of Robert Archibald Armour and Elizabeth Emily Crossley. Married Name 1933 As of 18 March 1933, her married name was Southwell. [S2] Index of BDM records, NSW BDM, Place of Registration: Yass; Year: 1910; Number: 22207. [S2] Index of BDM records, NSW BDM, Place of Registration: Boorowa; Year: 1933; Number: 1329. Married Name 1933 As of 1933, her married name was Crossley. End-Line Ivy Leveina Pollard has no known descendants. Death 18 April 1967 Elizabeth Jane Delaney died on Tuesday, 18 April 1967 at Yass, NSWG. [S2] Index of BDM records, NSW BDM, Place of Registration: Yass; Year: 1897; Number: 18126. Darcy Mark Thompson was the son of James Thompson and Mary Armstrong. [S2] Index of BDM records, NSW BDM, Registration - Place: Yass; Year: 1895; Number: 38674. End-Line Claude Edward Ryan has no known descendants. [S273] Rob Ryan, "Rob Ryan & Nita Crossley," e-mail to Robert Mote, 24 January 2002 +. [S2] Index of BDM records, NSW BDM, Place of Registration: Yass; Year: 1934; Number: 2974. Married Name 1933 As of 4 February 1933, her married name was Crossley. [S2] Index of BDM records, NSW BDM, Place of Registration: Bowral; Year : 1906; Number: 32632. [S2] Index of BDM records, NSW BDM, Place of Registration: Yass; Year: 1933; Number: 3218. 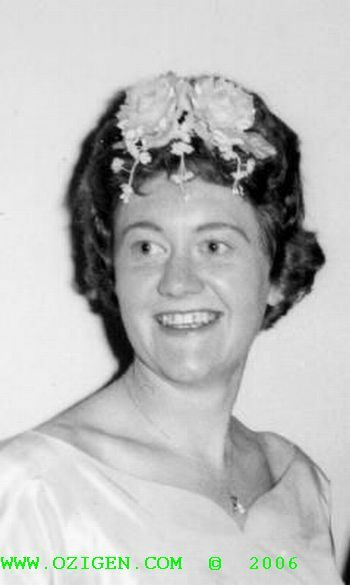 Birth 31 December 1939 Dawn Crossley was born on Sunday, 31 December 1939 at Yass, NSW, AustraliaG. She was the daughter of George Edward Crossley and Alma Grace Smith. Death 11 April 1980 Dawn Crossley died on Friday, 11 April 1980 at Perth, WA, AustraliaG, at age 40. Married Name 1965 As of 7 August 1965, her married name was Sharp. Married Name Her married name was Crossley. [S808] Stuart Goodfellow, "George Crossley's Descendants," e-mail to Robert Mote, February 2009.